When there are special guests for the lunch or dinner, dining table must be dressed up with some special efforts too. You can spread a nice, fresh table cover and then later on search for complementing accessories like napkins and mats to set a coordinated look. Some go to some steps forward by placing a gorgeous centerpiece on the table to steal the show. While others might focus on the chair covers too apart from the other decorations like wall frames, hangings etc in the dining space. All this seems to be common and a bit incomplete unless a runner comes into the picture. A runner- cloth narrow in size and made to overhang either vertically or horizontally. It’s the best way to bring the classy style all of a sudden for any formal meal. Its impact is so engrossing that it can be used even alone without table covers or napkins. Just a runner along with mats could be enough to set a nice, sophist acted ambiance for a lavish dinner. It’s exclusively about the round dining tables lying in your kitchen or dining space. If you are fed up of their dull, old look and just want to get rid of them, then just wait…. Probably, we could help you out with our exciting round table covers. From the lustrous, glossy look to high on fashion, they have got many reasons to light up your dinette. It would be really thrilling to see the dried leaves falling on the table or watching it glowing in the grace of bright yellow. If you are still not clear why the hell was table runner ever discovered, then we are here to clear some facts. Runner for many could be the shield to protect tables or table cloth. It is meant to be used either lengthwise or horizontally. 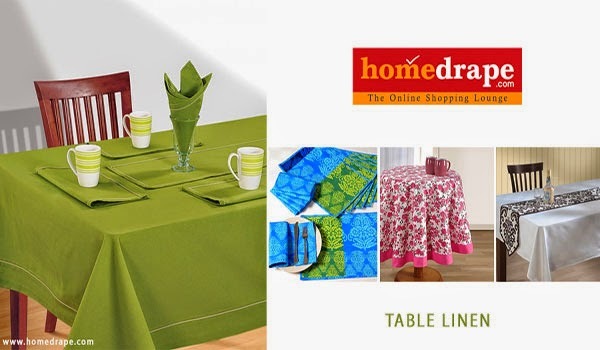 With or without other table linen accessories, runner is considered as an important factor for the sheer grace in the dinette. When you need the oomph or highly sophisticated ambiance, their role varies with their visuals aspects. A plain solid colored runner could be a smart way to bring color on your wooden table. Accentuate the impact by blending color with napkins and place mats. With its try to express your mood like with deep red there comes a royal feel where as green shades bring a relaxation in the atmosphere. 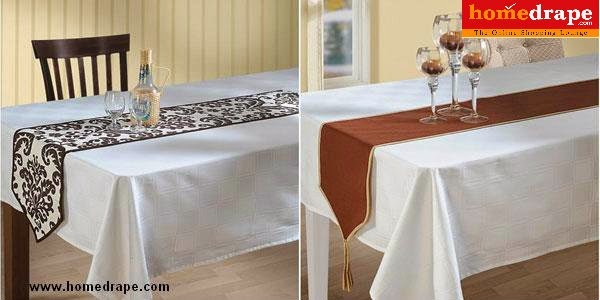 If you are using the table cover as well, then keep its shade soft muted such as beige or cream. It would help the runner and mats to pop out in the setting. For the contemporary feel, you could place many runners next to each other lengthwise. You could repeat one or two colors in a predefined fashion for this scheme. Coming to printed runners, they bring an artistic flavor in a simple, sober setting. Now, the artifact could be minimal or intricate depending upon your need. Also, prints could be pulled out from the design scheme of existing décor. Soft accents or a regal, luxurious feel, anything you can achieve with our pure cotton runners collection. They have the soothing, plush luster to uplift the mood of your dinette. So, it’s a birthday party or a formal, don’t forget to add the flawless grace in your eatery with these radiant runners. 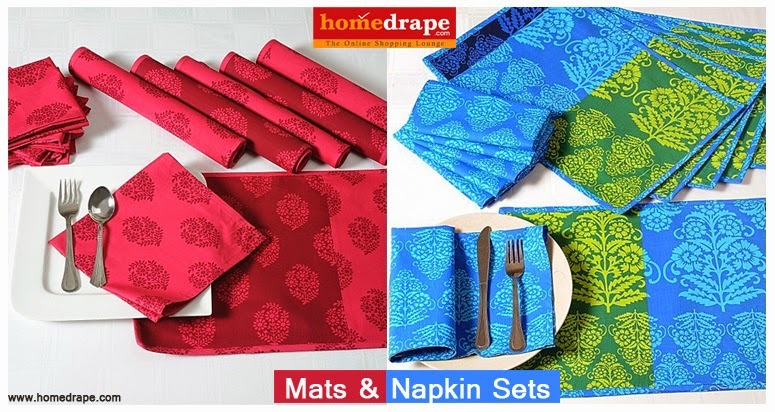 Without color bleeds, these cotton made ups are all set to add pizzazz in every dining space. Which picture a perfectly dressed dining table makes in your mind?? A table swathed around by cover and with nice, expensive centerpiece on it is an ideal way to dine out for majority. However, there is still something missing in this so called “perfect setting”. We are going to talk about napkins and place mats today. They are still just considered as accessories by many and don’t realize how impactful they could be. Their versatility to fit in any setting and bring out a beautiful pulled together look is simply brilliant. Think again if napkins are just a means to cover your lap and wiping the face. Remember your last visit to the restaurant? Go into a flash back and realize what an impact were those napkins besides or on your plate were making?? In a simple or complicated fold, anyhow they can add the personalized touch on the table. As the complexity of the fold gets intensified, more refined your aesthetic sense gets. 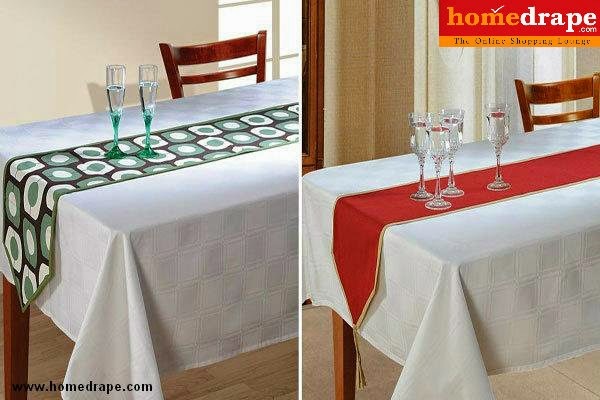 Moreover, when colors burst out on napkins, they become more effective in their decorative role. Let’s gear up to make your own dining space the plush restaurant where a restful ambiance will accentuate your appetite. Dim lights, pleasant music and a well served platter on your table is what makes dine out an interesting experience for us. It won’t be bad if you can create the magic of your favorite food joint right in your dinette. If you couldn’t believe us, then here we are with exciting ideas to gain your trust. First analyze the atmosphere of your dining space and then observe its needs. If you feel it’s just filled with wooden furniture and lacks a life, then you need colors, colors and some more colors. Let shades from a same group shower on your tabletop and bring a pulsating air to the setting. 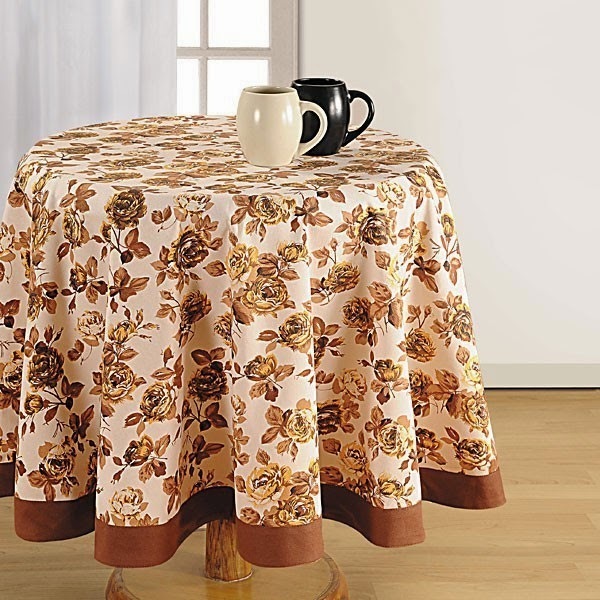 Here, you need the printed table covers to make this idea work effectively. Now, the print can be pulled out from historic culture or natural, depending upon your sense of style. If you have not come across the vibrant, peppy aprons yet, then Wake Up.You are really missing a lot if colorful and very interesting kitchen linen has not got your attention. 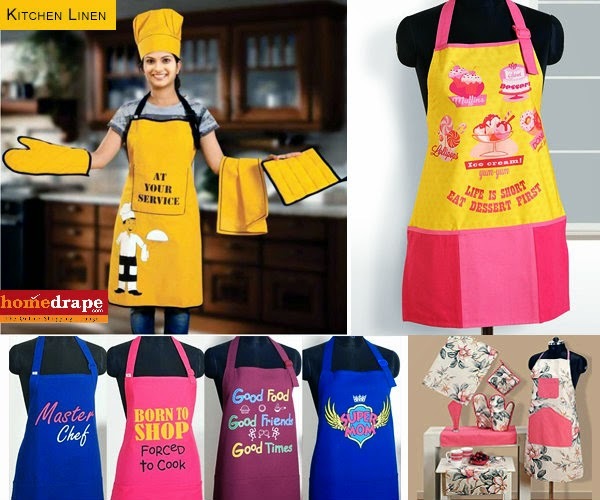 We are talking about the designer aprons which have got the brilliant luster due to outstanding shades. So, they can complement your outfit and even a décor. So, bring on the fun to your cookhouse and prepare meals in a great excitement. Select a new lively apron for each day of the week and make yourself a reason to envy for the peers. You couldn’t resist their catchy quotes that are enough to speak about your mood, persona and even the deepest feelings. Now, there a lot that can happen while preparing a cuisine for your loved ones. It’s not just the aprons folks but we are bringing you the complete range for a coordinated look. From head to toe, feel revived next time you step into the kitchen space. You have the chef cap to feel proud, apron for stains protection and gloves to shield your hands from heat. 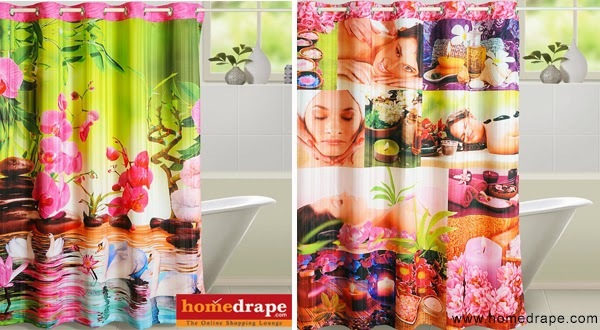 Shower curtains can add lots of fun and thrill to your bathroom. Taking a bath is going to be an exhilarating experience for you when an interesting scenery will surround you. So, decide you would like to have a shower in the mid of jungle feeling the greenery and fresh air all around?? Or underwater all bounded by small, colorful fishes seeing the gorgeous corals at the seabed? There is so much interesting you can experiment with your bathroom décor. Shower curtains actually have the dual function to amaze you. Firstly, their one side prevents the water from splashing out to undesirable areas, keeping the required space dry and clean. Secondly, their other side showcases engrossing design elements within the bathroom. Feel pampered by the ducks quacking in the pond or land up to an isolated region where you can loosen up the body. Feel totally relived once you come out of the shower after being mesmerized by the gorgeous visuals. There could be a boredom settling inside the milieu with the passing time. 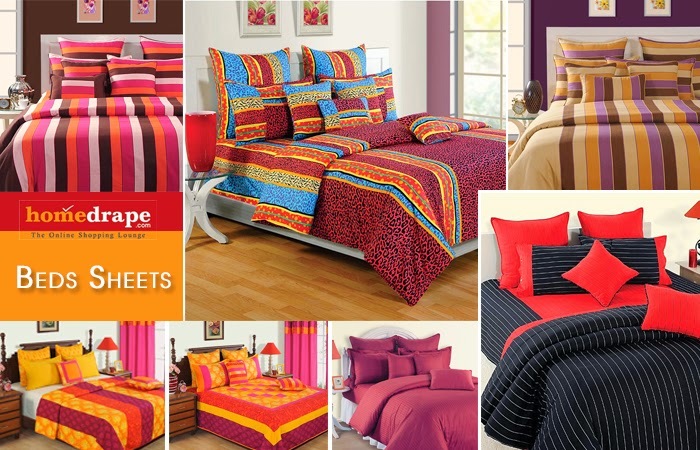 Burst out vibrant colors all around to enliven your home all of a sudden. No, we are not talking about painting walls with different strokes of shades. We here mean the glitzy furnishings which are refreshing enough to appeal anyone who looks at them. It sounds exciting since they bring style, comfort and creativity together within the price of one. Take any corner of your place; there is nothing that is not within the reach of linen. Bedroom, drawing room to the kitchen, anywhere and everywhere they have a special role to make your décor stylish and life as well. Bring the latest trends to enhance the splendor of your furniture flawlessly. 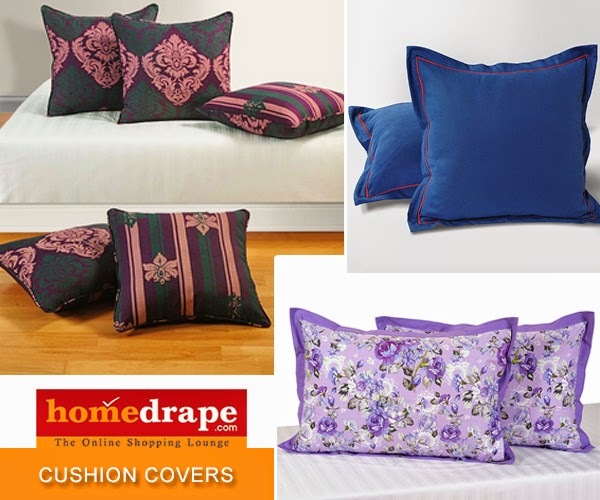 For the divan you have sheets with modern prints; for the cold couch make use of printed cushion covers to lend it a sense of contemporary edge.